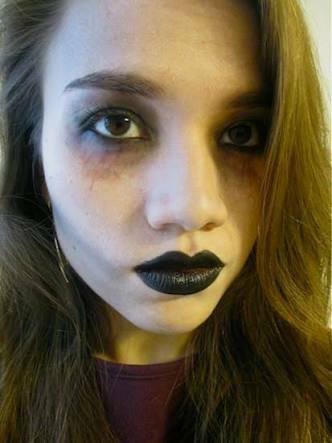 Just the costumes aren’t enough for one to get ready for All Hallow’s Eve, a spooky makeup can add up to your look. 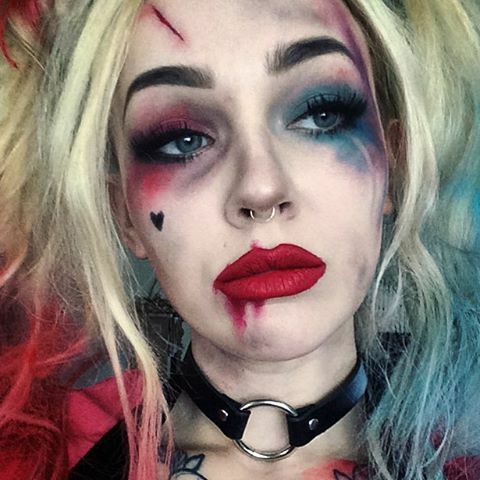 No matter how your creativity skills are, you are sure to get the best idea for your makeup. From clothing to makeup, it’s all expected to look perfect. In fact, rather than spending heap of money on expensive costumes, if you concentrate on your makeup, you’ll come out best. We hope you have a good stock of beauty products to let the creativity flow. Let’s begin. Make your skin deathly pale using a light colored compact powder and base foundation. Use red colored eyeshadow for one eye and blue for the other, blending it below the eyes as well. The messier, the better. Apply black eyeliner to darken the edges of your eyes and draw a small heart tattoo on the cheek. Now apply deep red lipstick then drag down one corner using an eyeshadow brush. For proper finishing, use purple eyeshadow to resemble bruises all over the face. Apply white colored foundation all over your face and outline your eye sockets with black liquid eyeliner, filling in with black eyeshadow. Brush out to spread it well. For your nose, use liquid eyeliner to draw the letter M across the center of your nose and fill it with black eyeshadow. Coming to the mouth, use white eyeliner pencil to color your lips white. Draw a proper pattern of teeth with uniformity to give that skull look. Do the finishing accordingly. Zombie look is quite basic and here is a super easy way to become a member of the undead. For the base, begin with swiping your white pencil and blend in with your fingers. After the base is ready, begin contouring using your black eyeshadow in the hollows of your cheeks and sides of your forehead. Now with the help of your eyeliner, make thick lines around your eyes and blend out the edges with black eyeshadow. For the tiny veins coming from the bottom of your eyes, use red lipstick and lip brush. The purple eyeshadow will help you get that bruised look. When all this is done, finally apply black lipstick and you’re ready. First apply white compact powder using a makeup sponge and apply black eyeliner around your eyes. Give your eyes a smoky look by adding some red lipstick to blend in. For the mouth, apply red lipstick and red lip liner extending the lines out from the edge of your natural lips, joining your eyes. Then color your nose tip with the same deep red color. 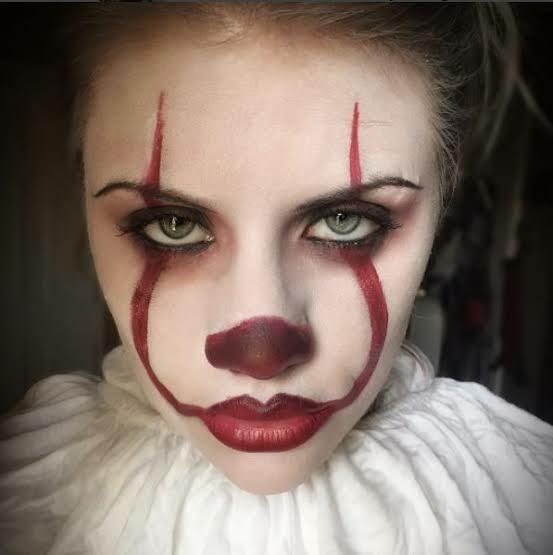 Wear a proper clown costume for the final look. Make sure the surface of your skin is smooth and clear. Apply some skin friendly blue colored glitter across your forehead and cheeks. 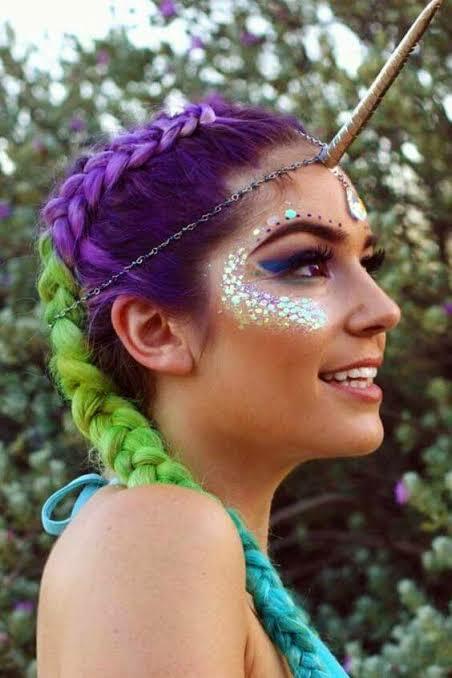 For the unicorn lips, add a swipe of pearlescent blue or pink lipstick and dab a highlighter over your lips for the glow. Coming to the eyes, sweep a pink eyeshadow under the brows and deep red beneath this pink. You can even go for blue color. Now apply black eyeshadow to the outside corner of the eye. Do your best to get that smoky eyes look. For the best look, wear a wig or get your hair a temporary set of colors. This is one of the makeups that are in trend this year. Because why not! Game of Thrones it is! Begin with dabbing white color all over your face. 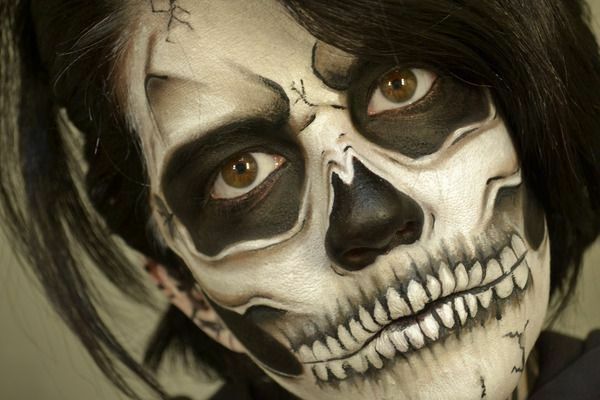 Using three face paints- white, black and pale blue, create ghoulish effects on the face. For accuracy, first, outline the patches that need to be colored. 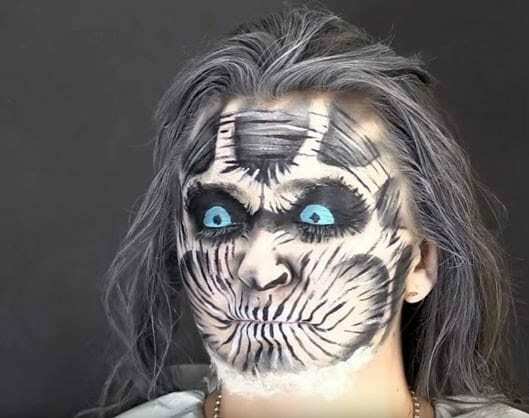 Then using a thin brush, create lines just how the white walkers have. Now color the eye sockets black and make a blue colored eye on the eyelid to give final touches. Make your hair look all shabby for best results. No white base makeup is required here, you can begin with your skin color foundation. 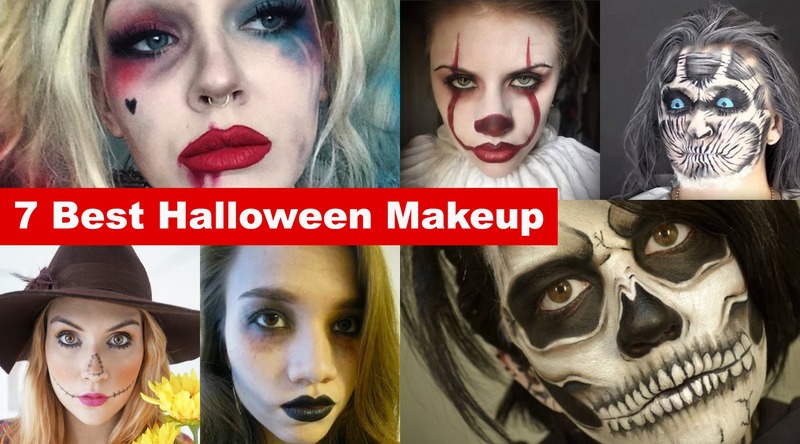 For the scarecrow designs on your face, use a black eyeliner and outline the bottom of your eyes with the same design that you used for your mouth. Apply orange eyeshadow to the circle on your nose and your cheeks for a better finishing look. This one couldn’t be any easier.